As a first year health sciences librarian, I have not yet conducted a systematic review. However, as a speech-language pathologist, I learned about evidence-based medicine and the importance of clinical expertise combined with clinical evidence and patient values. As a librarian, I’m now able to combine these experiences, allowing me to view see evidence-based medicine more holistically. In the past month, I attended two professional development courses. The first was a Systematic Review Workshop held by the University of Pittsburgh. The second was an Edward Tufte course titled “Presenting Data and Information”. While these are two seemingly unrelated subjects, I left both reconsidering how we literally and figuratively view evidence-based medicine. Is the display revealing the truth? Are the data carefully documented? Do the methods of display avoid spurious readings of the data? Are appropriate comparisons and contexts shown? While there is a lot of information in this image, I don’t think it is very clear. I have spoken to librarians (in the health sciences and not in the health sciences) that agree. I think this is a problem. I don’t think all librarians need to immediately know what cohort studies are, but I do think they should understand its context within the visual. Is it? How do we know if this truthfully represent the quantity of each type of study/information? I believe that systematic reviews are probably the least in quantity and expert opinion are the most in quantity. That makes logical sense given the level of difficulty to produce and disperse this type of information. However, what about the types of research in between? Also, is one type of evidence inherently less biased than the ones below? Several studies suggest that systematic reviews may be systematic, but are not always transparent or completely reported and are outdated. This includes systematic reviews published in Cochrane, the highest standard of systematic reviews. While there are standards, they are very frequently not followed. However, following these standards can be very challenging and paradoxical. It’s very possible that a cohort study can be designed in a way that is much more systematic and informed than even a systematic review. When I see the word “representation”, I am thinking about visual representation – the pyramid shape itself. There is an assumed hierarchy not just in terms of evidence, but also superiority here. This is a simplistic and elitist way of thinking about this information rather than being informative and useful. If you think about it, a systematic review cannot be conducted without having supporting RCT’s or case reports, etc. Research had to start somewhere. It this was seen as more of a scholarly conversation, I wonder if there would be a place for hierarchy. 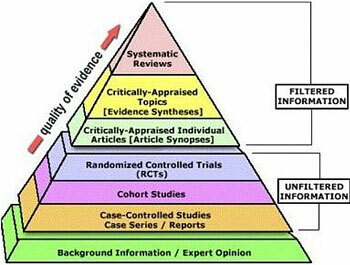 I have learned that the slices of the pyramid represent the quantity of publications of each level of evidence. However, this is not something that can be easily understood by looking at this visual alone. Also, if the sizes of the slices represent quantity, why so? Quality is indicated in this version with the arrow going up the pyramid. This helps to represent idea of quality and quantity. However, if evidence-based medicine wants to prioritize quality, maybe the sizes of the slices should represent the quality, not quantity, of evidence. If it is viewed from that perspective, the systematic review slice should be the biggest because it is ideally the highest quality. Or, should the slices represent the amount of bias? This is all quite unclear. Are the data carefully documented? Do the methods of display avoid spurious readings of the data? I don’t believe that any data is actually represented here. Moreso, it feels like it’s being told to us so we believe it. I understand this is a visual model, but this image has been floating around so much that it is taken as the truth. I don’t think one can avoid spurious readings of the data because data aren’t represented here. I do think that this pyramid provides visual way to compare information, however, I don’t think contexts are shown. Again, should the amount of each level of evidence referring quantity or quality? Is the context meant to indicate research superiority? If not, perhaps a pyramid isn’t the best shape. By virtue of its definition, a pyramid has an apex at the top, indicating superiority. Maybe a different shape or representation can provide alternate contexts. So, how should evidence-based medicine be represented? I have presented my own perceptions sprinkled with perceptions from others. I’m a new librarian, and my opinion has value. However, I also think this concept needs to be re-envisioned collectively with healthcare practitioners, researchers, librarians, and patients. Another visualization that has been proposed is the Health Care Literature Wedge. It would look like a triangle with the apex facing right indicating progressive research stages. I do think there are other shapes or concepts to consider. Perhaps concentric circles? Perhaps this can be a sort of spectrum? 3D maybe? I really don’t know. Another concept to consider is that systematic reviews are intended to reduce bias pertaining to a research question. Instead of reducing bias, maybe we can look at systematic reviews as having increased perspectives? How could this change the way evidence-based medicine is visualized? I think the questions posed by Tufte can help to guide this. And I’m sure there are other questions and models than can also help. I would love to hear other epistemologies and/or models, so please share! McKibbon, K. A. (1998). Evidence-based practice. Bulletin of the Medical Library Association, 86(3), 396–401. Thanks for the thoughtful comments Nisha! I am teaching EBP principles for the first time too. They pyramid is not a perfect representation but I too am not sure what alternate visualization should be used.